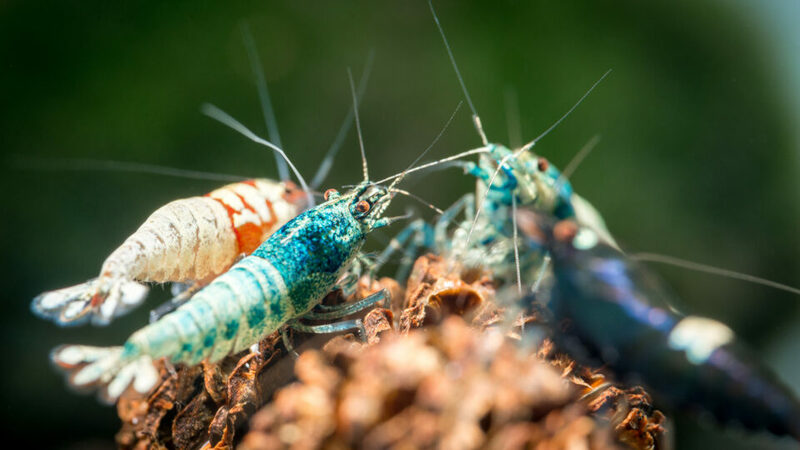 “There’s such a thing as ornamental shrimp?” This is the typical response of family and friends when I speak to them about my recent hobby of keeping ornamental shrimp. Believe it or not, there is growing interest around the world about breeding and keeping these little freshwater critters as pets. In some countries, their popularity even rival traditional fish keeping! What once used to be considered another algae eater in tanks has quickly become an object of interest for aquarium enthusiasts, given their behavior, varieties, and breeding possibilities. They are marvelous to look at, and as such are wonderful subjects to photograph. 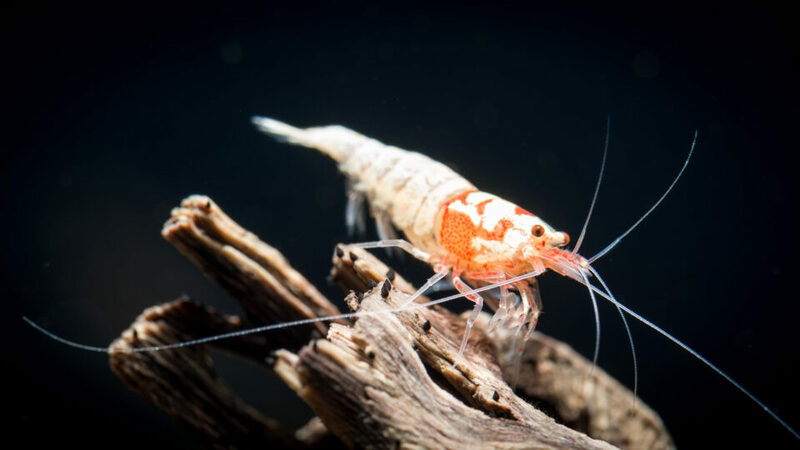 The hobby itself is primarily based upon varieties of Neocardina davidi (cherry shrimp) or Caridina cantonensis, which has recently been further categorized as Caridina logemanni (crystal shrimp), mariae and serrata (tiger shrimp). There’s also a popular variety called Taiwan Bees, which originate from a crystal x tiger shrimp crossing, and come in a large range of colors and patterns. They grow no larger than 2 to 3 cm in length (hence the macro realm of photography), reach reproductive maturity in 3 to 5 months, and have a lifespan that can reach about two years. 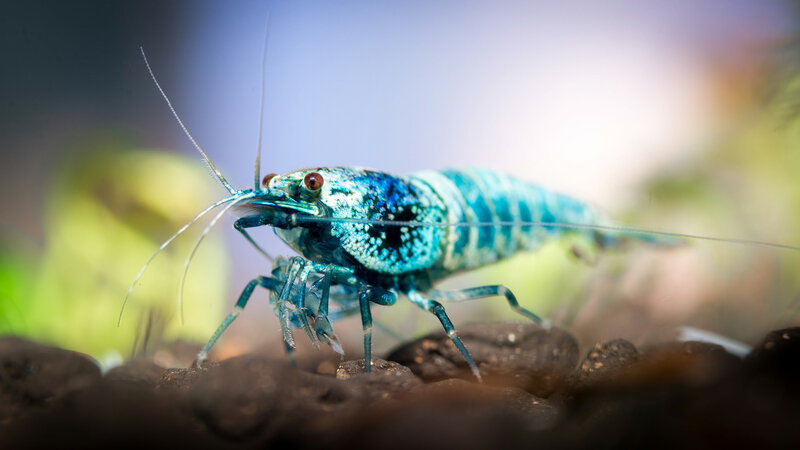 My own shrimp collection is comprised of blue bolts, pinto mischlings, pandas, king kongs, and tangerine tigers; I hope you enjoy looking at them as much as I do! 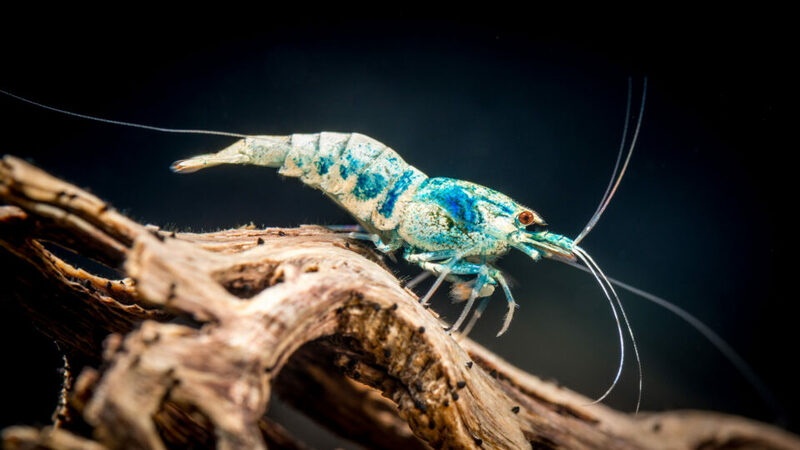 My inspiration to pursue shrimp photography comes from Chris Lukhaup, a famous aquascaper, professional photographer, and one of the world’s leading shrimp specialists. Search for any of his images and you will quickly see why he is always brought out to aquatic conferences and expeditions to document the discovery of new freshwater life. 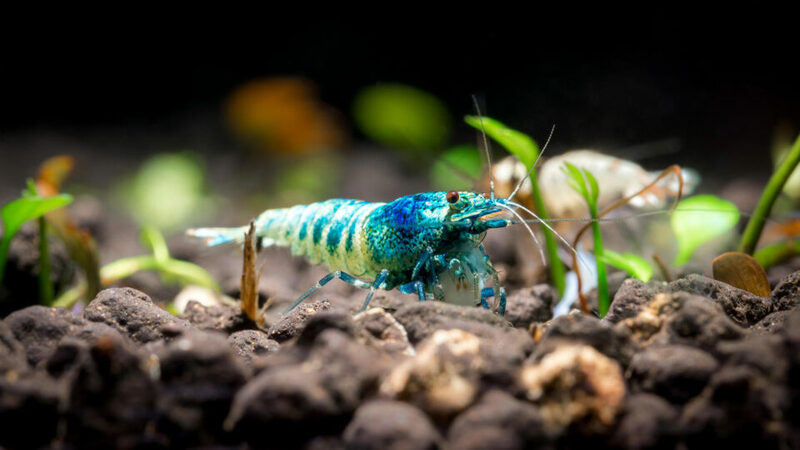 Learning how to capture breath taking images of ornamental shrimp like him has certainly pushed my knowledge and skills in both shrimp keeping and photography. There is the added bonus of being able to do this sort of photography in the comfort of your own home. 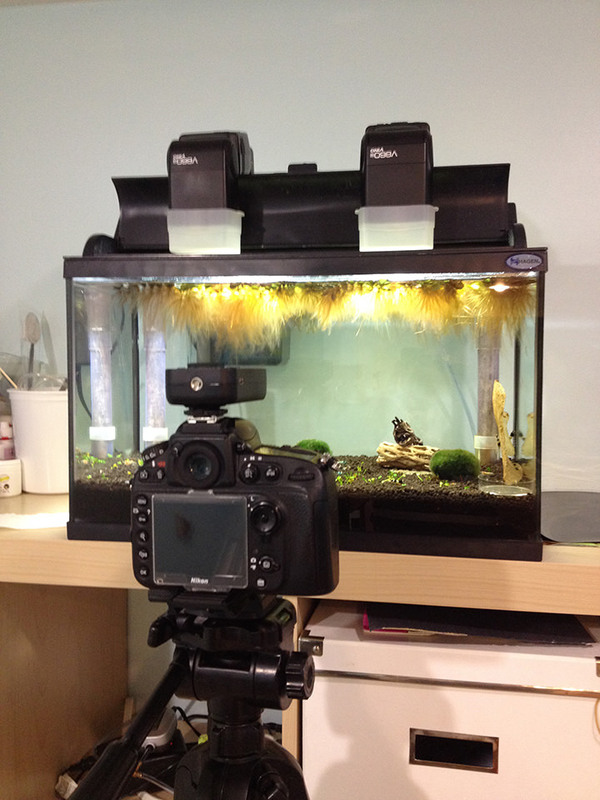 Photographing your own aquarium means you have all the control in lighting, staging, and specimens. 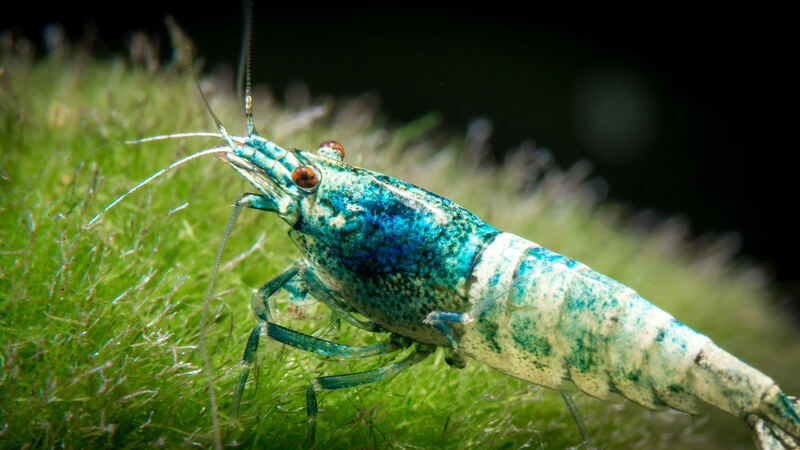 As a father of a young family, nap time for the kids becomes shrimp admiring and macro photography time for me! Like most specialty areas of photography, macro work will require a specific set of equipment to help you achieve the images you want. There are a variety of tools that can help you achieve greater image magnification, such as diopters, extension tubes, and macro lenses. 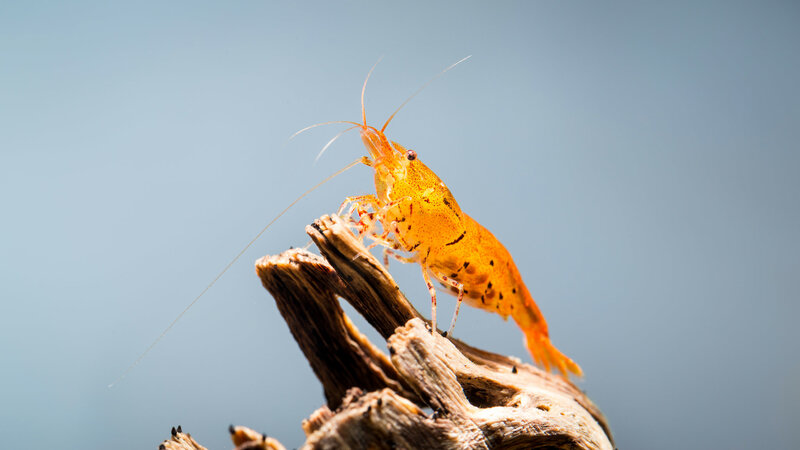 When my brother-in-law first introduced me to his collection of shrimp, I started with a Canon 60D and a 55-250mm STM lens with a Raynox DCR-250 diopter to capture images of his shrimp. This combination allowed me to get up to 0.725x magnification, but the images were grainy since I had shot them at a high ISO with a crop sensor camera. Not to say that a crop sensor camera is inadequate! Quite the contrary, Chris Lukhaup himself shoots with a Canon 7D, and many other crop sensor shooters have fantastic shrimp images. Adequate lighting is more important to getting good quality shots after all, but more on that later! When I started photographing my own shrimp, I had made a jump (from crop to full frame) to a Nikon D600, and now a D800E with a Tamron 90mm VC Macro lens. I also purchased Kenko AF extension tubes to go beyond 1:1 magnification. 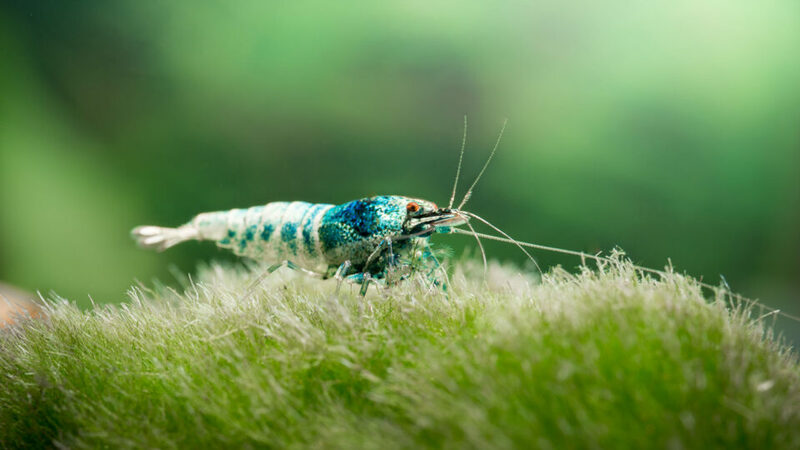 Given that the size of an adult shrimp is no more than 2 to 3 cm, using a macro lens alone at minimum focus distance (MFD) on a full frame camera generally allows an image of the entire shrimp to be captured, with room to compose the shot as well. Adding on extension tubes can get you closer shots of smaller shrimplets, or various parts of interest on the shrimp. Macro photography provides a significant set of challenges in terms of lighting and focus. 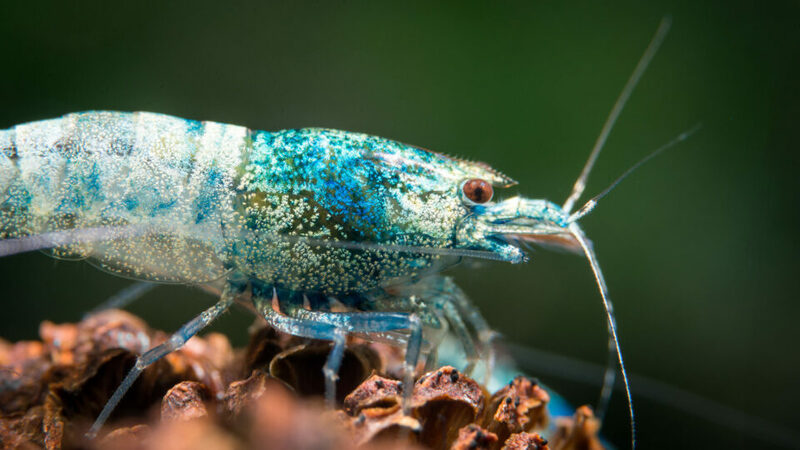 Shrimp are constantly moving, so focus stacking is generally out of the question. 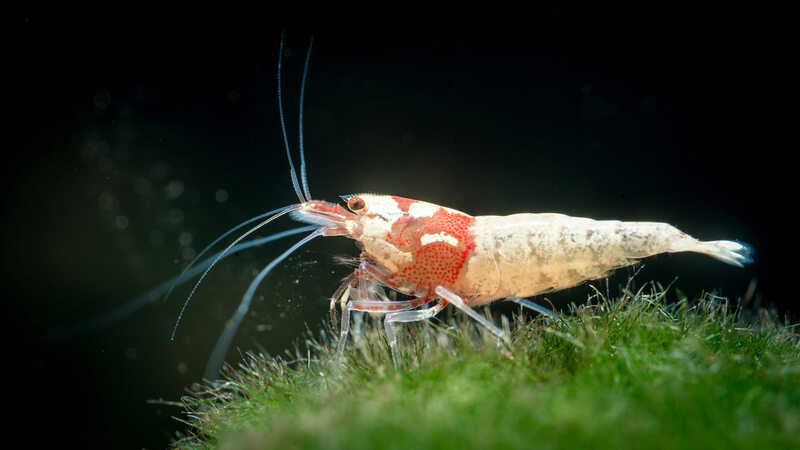 You need a narrow aperture to get enough of the shrimp’s eyes and body in focus, as well as a fast enough shutter speed to capture the image if the shrimp is moving. Most aquarium lights are not bright enough for such aperture and shutter speed combinations, so this means that your images will be shot at a higher ISO rating (1600 or higher). I found that the graininess of the image at such high ISO levels degrade the detail you’d be hoping to capture. To get the best image quality, shooting at ISO 100 to 400 will most likely require you to use a flash setup to provide additional lighting. This is where your specific aquarium location and setup may lead to some challenges. If you’re like Chris Lukhaup, he uses a soft box above a photoshoot tank to achieve his images. This would require you to have a glass lid or no lid on top of your aquarium. As my own tank is on the top of a tall shelf (I didn’t want my kids to feed my shrimp a coin or candy by accident), I was unable to place a soft box over it. Thankfully, the design of my tank lid allows me to perch one or two flashes with diffusers at various angles just above the water. These flashes are triggered with radio controllers. In my earlier days of shooting shrimp, I struggled to get good captures since the depth of field was so narrow, even at an aperture of F16. To gain some confidence, I set my aperture to be as narrow as F32 to F40 to try and get more of the shrimp in focus! At these aperture levels, I noticed the effects of diffraction made the images less sharp. After a little research, I found out that my lens and camera body combination allows for sharp images to be taken up to F22 before diffraction sets in. As such, I’ve kept most of my images at F18 to F22 to get the best of image sharpness and depth of field, depending on the angle of the shot. Speaking of angles, you’ll get the least amount of distortion from the aquarium glass in your shots if you are as perpendicular and level to the subject as possible! I have also tried a macro focusing rail for my tripod to stabilize my shots. Essentially, you leave the focus of the lens at MFD and use the dials on the macro rail to take care of focusing, much like using a microscope to focus on a glass slide. This combination did help get sharper images, but it is more cumbersome to work with. The moment you see a shrimp striking a good pose on the other side of the tank, shifting things over and getting things in focus often meant the shrimp has already gone off to graze somewhere else! I have since resorted back to hand holding my shots, and doing my best to stabilize the camera with good technique (such as bracing in your elbows, holding your breath to steady the camera). I would move forward or backward to focus on the shrimp’s eyes while the lens is at MFD. Using my hands on the edge of the shelf and holding onto the hood also helped stabilize my shots. I did try doing the same with the camera on live view, but the image on the screen would be so dark (given the narrow aperture) that it was still a bit hit and miss, and it also drained the battery life quickly. I believe my number of keepers have improved since I purchased a DK-17M magnifying eyepiece to help see when the shrimp’s eyes are in focus. If all this doesn’t help you get sharp macro images, consider getting your lens calibrated too. For those of us who are unaware, aquariums can be purchased with different types of glass. Regular aquarium glass contains more iron, and thus naturally has a greenish tint to it. Starphire (sometimes called Starfire) glass contains less iron, and thus has a bluish tint to it. Many hobbyists will tout that looking at subjects in a more expensive starphire tank makes for a better viewing experience, but it is known to be a softer glass that may get scratches more easily. From a photography point of view, I would assume that any color changes from the aquarium glass can be easily fixed in post-processing. Thicker glass tanks can also lead to greater image distortion if you are not shooting square on the subject. There are many interesting props that can be used for the shrimp to perch and pose on. There are a large variety of plants, leaves, cones, wood, rocks, and ceramic structures that can serve as the main stage or background for your shots. Different backgrounds for the aquarium itself can be purchased to provide the right backdrop. Shooting at a narrow aperture also means the background will appear darker, so you may consider using a backlight to fill the background. 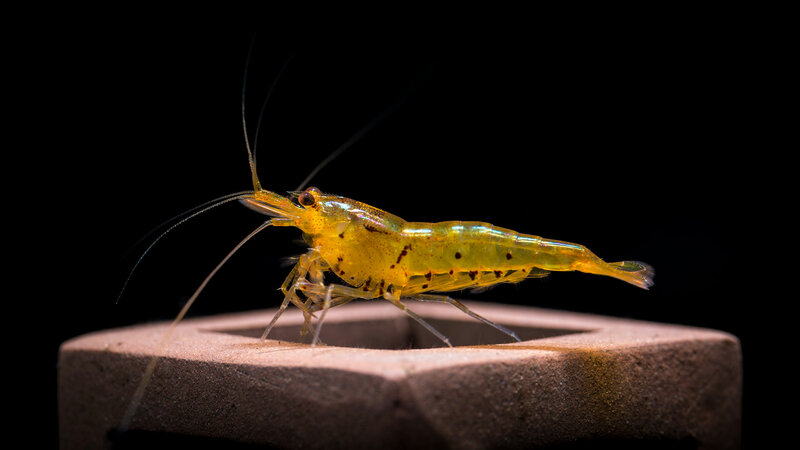 Personally, I like the low key style shots with most shrimp as it provides a nice contrast to the shrimp, and so I have a black aquarium background. 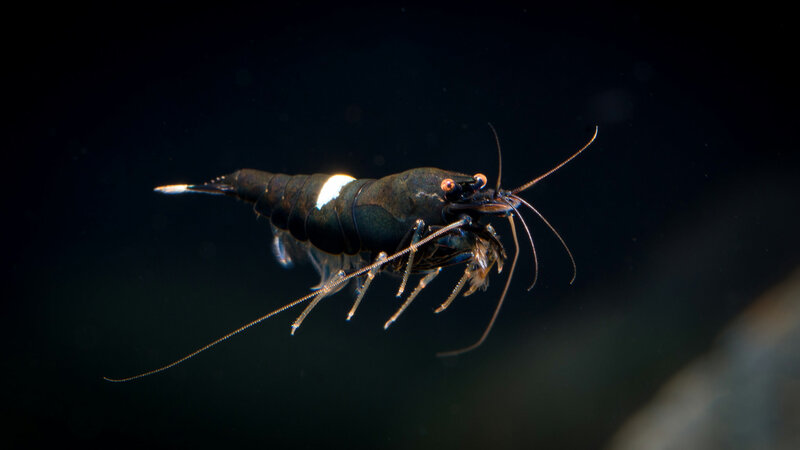 Much like taking a picture of a person with dark hair with a dark background, darker shrimp may benefit from getting a kicker light or a lighter background for contrast. For my particular lens and camera combination, the MFD is 30 cm from the sensor (as indicated with a symbol that has a line going through a circle near your eye piece). This means that I have about another 5 cm of room to work with beyond my lens with a hood (about 10 cm without the hood). When my moss balls, alder cones, and cholla wood pieces were initially placed too far from the front of the tank, I was unable to focus on a shrimp at 1:1 magnification if they were perched on these objects. I can’t recall how many times I’ve bumped into the tank as I was trying to get a shrimp in focus! As such, I moved these objects closer to the front of the tank to give me more room to work with and get 1:1 magnification. 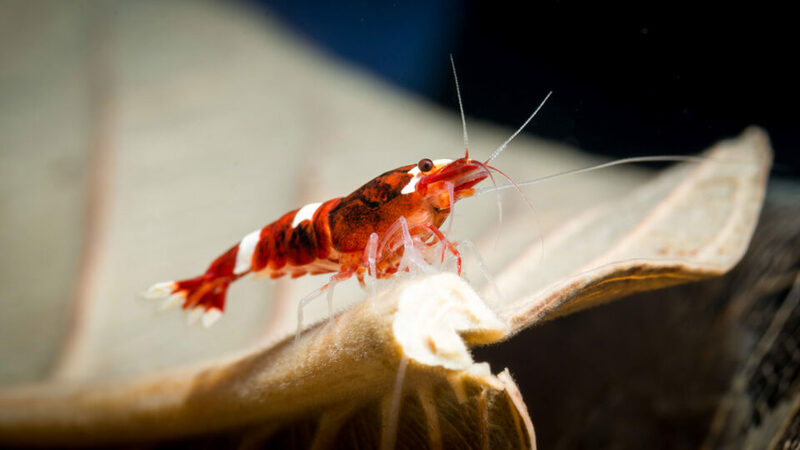 Be careful about taking images of the shrimp that are too close to your aquarium glass though, as the image will pick up scratches and imperfections in the aquarium glass if it isn’t clean. 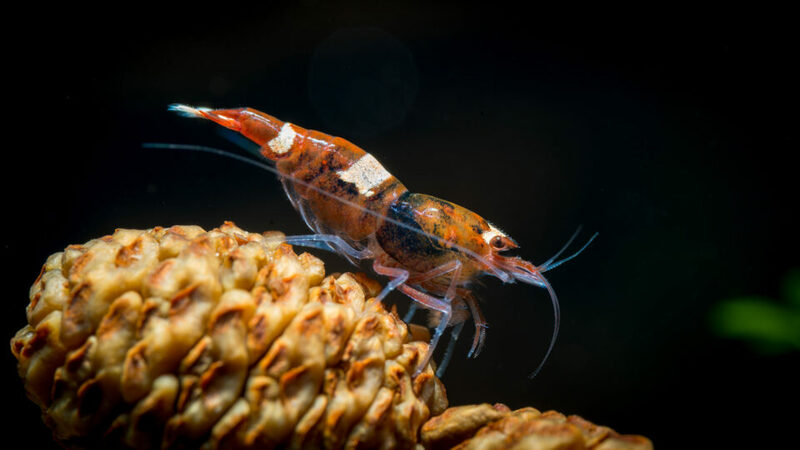 Ornamental shrimp are bottom feeders and scavengers with limited storage in their digestive system. As such, they are constantly moving around feeding off of algae and bacterial biofilm on the surfaces of aquarium. 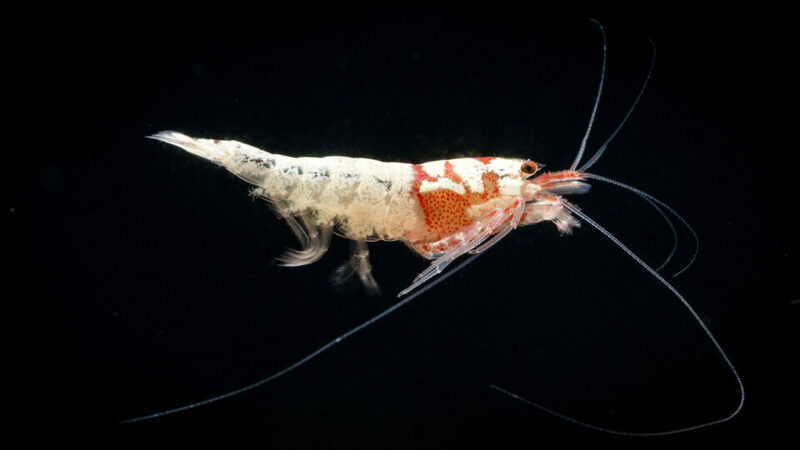 They can certainly be lured to new foods that you drop in, and some food are made so that each shrimp can run off with a nugget of food in their claws. This will allow you to get the shrimp to be more stationary for your shots, but it also means you’ll be getting food debris in your shot and a less natural looking image. I recall how frustrated I was waiting for a shrimp to perch itself on a marimo ball one evening. I decided to take a pair of tongs and flipped the marimo ball over to expose a portion of it that had untouched biofilm on it. This prompted a few shrimp to come over to investigate and graze, which allowed me to get some nice shots of them on the ball of moss. Editing out the food debris was tedious in post processing, but not impossible. Speaking of foods, various foods alter the hormonal control of pigment cells in the shells of the shrimp. 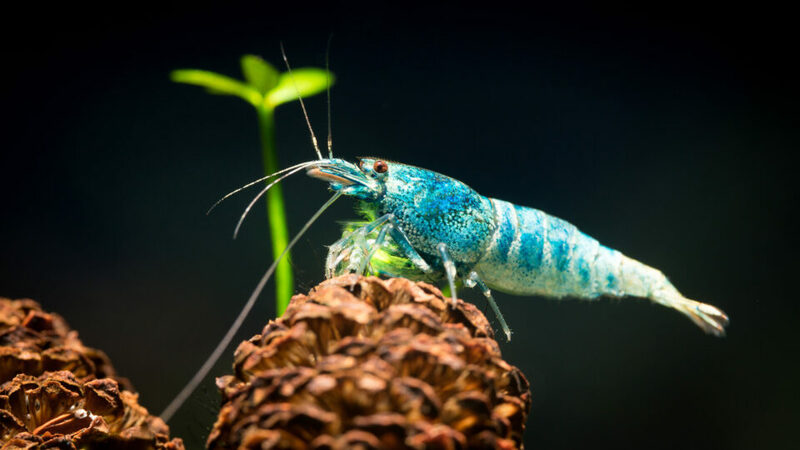 Healthy shrimp will give off very vibrant colors in their shells! Discoloration may indicate that the shrimp is stressed or unhealthy. Watching shrimp molt out of their old shell is an interesting event to witness. When they have grown larger, they will burst out of their shell and leave behind a ghostly outline of their prior shape. Molting can often be witnessed after water changes are done to the aquarium, or after a low pressure weather system such as rain passes by. 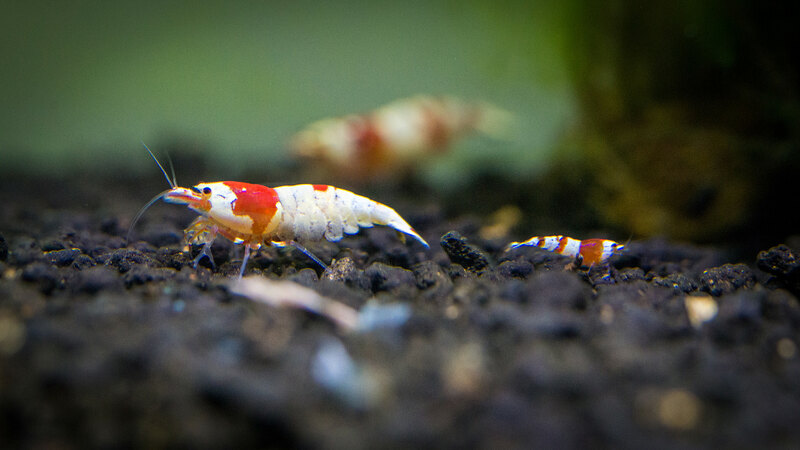 Don’t remove the molts though, as they provide good nutrition for other shrimp in the tank! When a female is ready to mate, they also molt and release chemicals that attract males in the water. Females are quite timid after completing a molt that gives her tail the right shape to carry eggs, and so she tries her best to hide from males. The males swim actively all over the tank in search for the female, and many breeders call this movement of swimming “the dance”. This is a great time to get shots of “shrimp in flight”, as they actively seek all corners of the tank for the ready female. 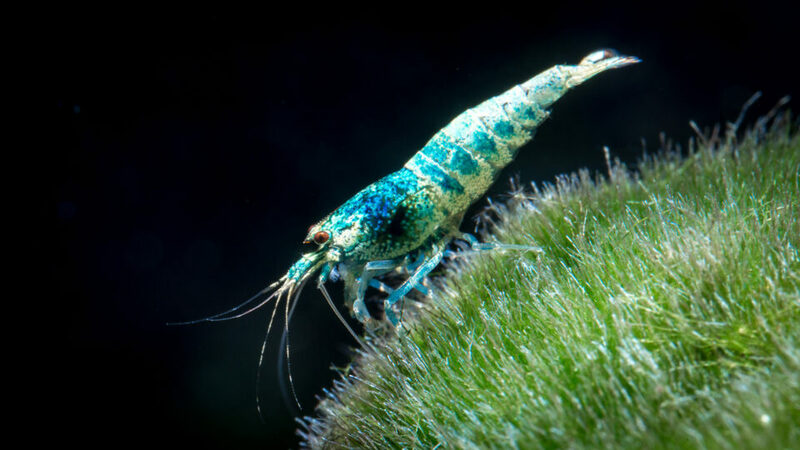 When female shrimp are carrying eggs, or are “berried”, they tend to be shy and hide more early on. Startling them too much with flash photography may stress them out, which may subsequently cause them to drop their eggs. Being “berried” does lead to hormonal changes that make their shells more colorful though. 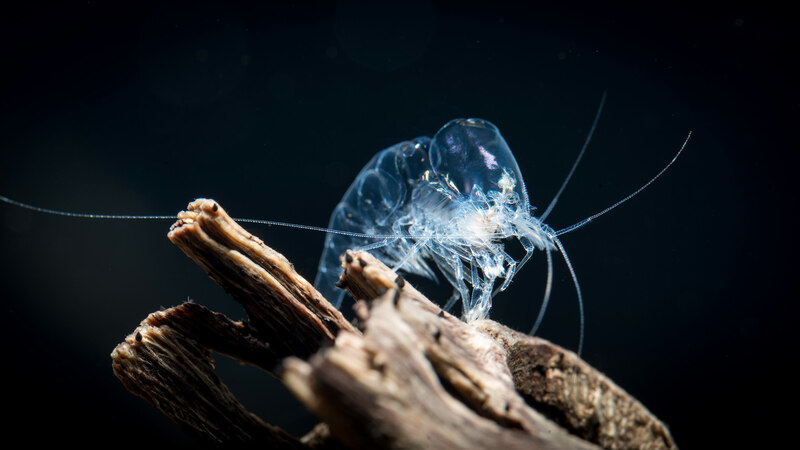 After carrying the eggs for about 4-5 weeks, the shrimplets hatch from below the female and get ready to brave a whole new world. I hope that taking and sharing inspiring photos of your aquatic pets will promote further understanding and growth in those hobbyist areas. If you are interested in shrimp keeping and breeding, I highly recommend searching for and connecting with international and local communities online to learn more about the hobby. This guest post was submitted by Steven Chan, a father, science teacher, and photographer from Toronto, Canada. 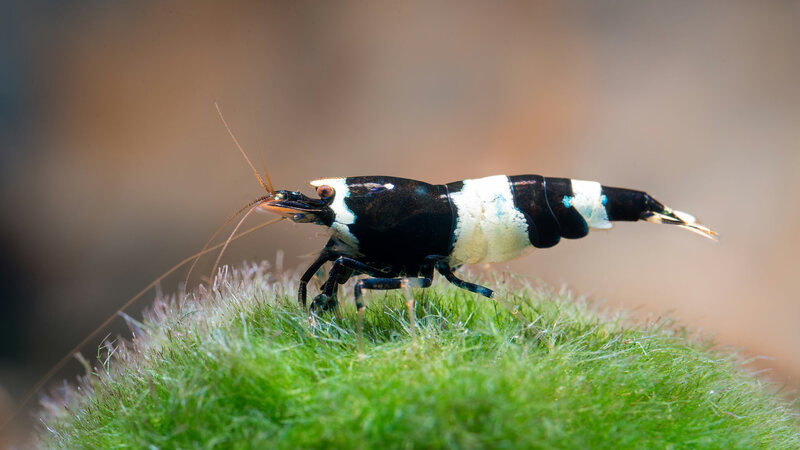 Besides taking photographs of his family, he loves shooting pictures of wildlife and macros of his shrimp. You can see some of his work here. He also thanks Nasim, Thomas, and Spencer for their informative articles and gear reviews that were referenced. They have been instrumental in his learning and purchases, and they have taught him how to be a better and more mindful photographer overall. Thank you! Most interesting and unique. Bravo! They’re called asians now, not orientals. What? Ornamental? Oh. Never mind, I thought you said oriental. Not many people in the hobby actually call them ornamental shrimp actually, haha! All the varieties that exist has created a large number of acronyms to talk about the type of shrimp out there. 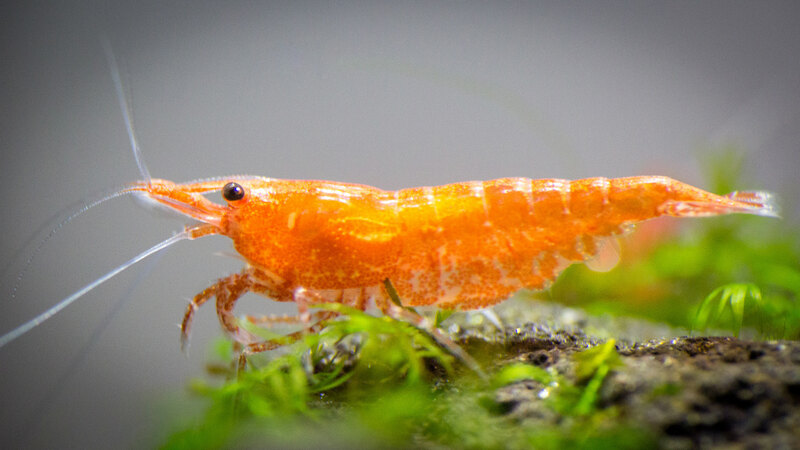 Crystal red shrimp (CRS), crystal black shrimp (CBS), pure red lines (PRL), pure black lines (PBL), blue bolts (BB), red cherry shrimp (RCS), super crystal reds (SCR), black king kongs (BKK), red king kongs (RKK) etc… I believe the Shrimp Keepers Forum has a nice glossary of all the commonly used terms! I was wondering about that f/16 and ISO100. Thank you for providing a photo of the setup. It explain everything. I forgot to mention that many hobbyists keep floating plants as well to soak up nitrates created by the ammonia waste from shrimp and leftover foods. I had so many floaters, they blocked my flash! I purged a bunch after I kept getting dark shots. I had an semi-transparent aquarium background that had pictures of plants in it, so I was able to get it exposed in the shot by having another flash trigger behind the background. 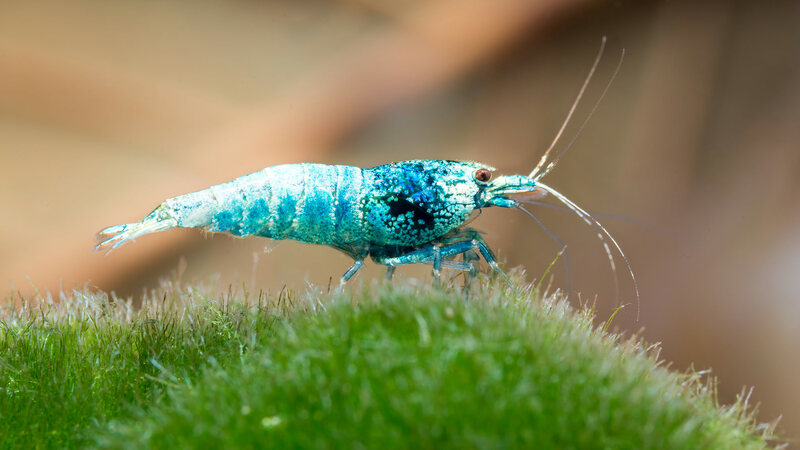 Great article and images, what a beautiful world we live in, these shrimp are gorgeous. Wow, Steven- beautiful shots and a great explanation of how to do the set up and photographing. Thanks! Great article, opening new close up opportunities to reveal the Amazing Arthropods. My boring vertebrate fish tanks with Zebras and Platies may soon be evicted to make room for these – who are lower on the Tree of Life.. Arachnids can wait. Wow, sounds like you have a lot of aquarium experience! Go for it and check out more about shrimp! I learned a lot about keeping them from the Shrimp Spot forum. What a great article and such fantastic photos! Great read :) nice work buddy! I love the shot of the clear shrimp (shrimp-macro 19, the cover shot). Amazing specimen, great lighting. I should consider shooting my pacu. Thanks for the article. Very good and educating! Important information as more and more people get in to photography of tank inhabitants. The shedded shell looks amazing (as the rest)… Makes me wonder, have you ever considereddoing a timelapse of their shedding? How long does the shedding take? There are actually lots of traditional dishes that use dried small shrimp in Chinese cuisine! I’m personally not a fan of getting them stuck in my teeth, but they’re out there. Usually in sticky rice dishes! I really enjoyed this interesting macro article and excellent close-ups; it brought back memories of my 1960’s aquarium, long before I owned a camera. I kept a North American crayfish until it ate the tail of my Shubunkin. Thanks for the lighting information, very important. Thank you! 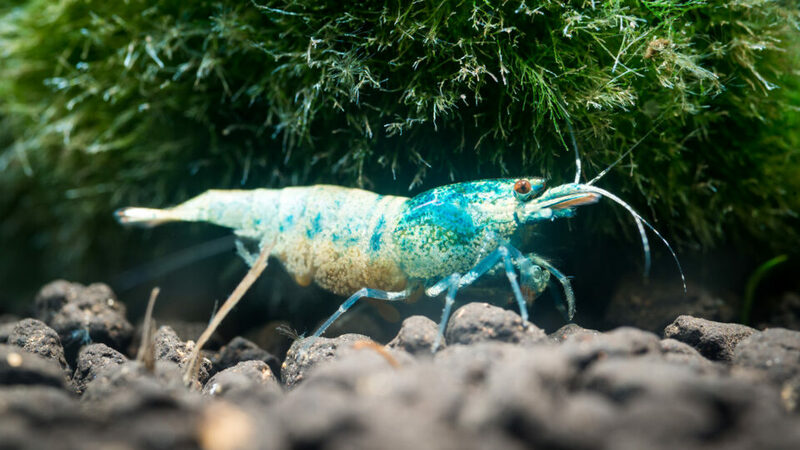 Crayfish keeping has picked up on popularity recently too, as shrimp keepers are looking to diversify the type of inhabitants in their tanks. My local shrimp store has them, and they are really interesting to look at! Great photos and good clear explanation. Well done! What an excellent article. I particularly enjoyed the stunning photography but the engaging story-line made it a compelling read. EXCELLENT job, Steven.